A French political activist and religious mystic, Simone Weil was a renowned and enigmatic Christian thinker. Her ambivalence toward the Catholic Church and her life of rigorous self-discipline and self-denial have become as well known and as much a part of her influence as her written works, most of which were collected from her notebooks and published after her death. Often paradoxical and contradictory, Weil’s writings convey her intense compassion for the suffering of others, her disdain of nihilism (the belief that there is no meaning or purpose in existence), and her longing to be united with God. The Beginnings of Activism. 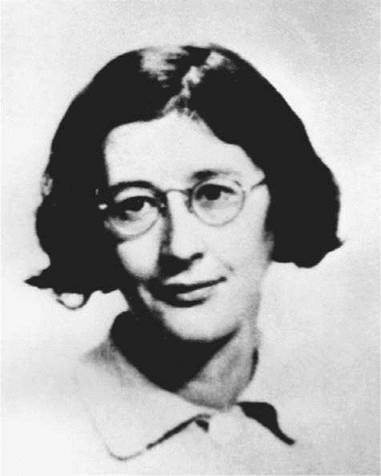 Simone Adolphine Weil was born in Paris on February 3, 1909, the daughter of a prosperous doctor and his wife. Her childhood was marked by intellectual precociousness and a sensitivity to human suffering. At the age of five, for example, she refused to eat sugar because none could be supplied to the soldiers at the front during World War I; at the age of six, she was able to quote passages of seventeenth-century French dramatist Jean Racine from memory. Although she earned her high school degree at fifteen, she felt extremely inferior to her brother, who was a mathematical prodigy. Consequently, she seriously considered suicide and nearly suffered a nervous breakdown early in her life. Between 1925 and 1928, Weil studied at the Henri IV Lycee under the philosopher Alain (Emile-Auguste Chartier), whose influence intensified Weil’s self-questioning search for truth. Following the completion of her Ecole Normale studies in 1931, Weil taught philosophy for several years in various provincial girls’ schools. These were years of severe economic depression and great political upheaval in Europe, and Weil’s interest in the common worker and her passionate concern for social justice led her to devote all of her time outside of teaching to political activism in the French trade-union (syndicalist) movement. She taught classes for workingmen, took part in meetings and demonstrations, and wrote for a variety of leftist periodicals that supported a workers’ revolution and the establishment of a communist society. At first Weil shared her comrades’ belief that a workers’ revolution was in the near future. Soon, however, both her experience with the revolutionary movement and her observation of the international political situation led her to the following conclusions: What had developed in the 1930s was different from anything Karl Marx (author of the foundational text of the communist movement, The Communist Manifesto, 1848) had expected, there were no signs of the working-class revolution, and a new oppressive class was emerging—the managerial bureaucracy. Though Weil was an admirer of Marx himself, she became a critic of Marxism. In the last half of 1934, she wrote a lengthy essay, Oppression and Liberty (1955), in which she summed up the inadequacies of Marxism, attempted her own analysis of social oppression, and outlined a theoretical picture of a free society. Experiences in Factories and the Spanish Civil War. Between 1934 and 1935, Weil’s intense sympathy for the working class led her to take a leave of absence from teaching to spend eight months as an anonymous worker in three Paris factories. This experience reinforced her conviction that political revolution without a total transformation of the methods of production—which depended on the subordination of the worker both to the machine and to managerial bureaucracy—would do nothing to alleviate working-class oppression. When the Spanish Civil War broke out in July 1936, Weil, hoping that a genuine working-class revolution was under way in Spain, went immediately to Barcelona. The Spanish Civil War was a conflict between the ultranationalist forces of General Francisco Franco and the Republican forces. Many foreigners, including large number of artists and writers, volunteered to serve on the side of the Republicans. Weil was accepted into a militia unit, but she had to be hospitalized after only a week when her foot and ankle were badly burned in a camp accident. Her experiences in Spain further disillusioned her; she observed so much brutality on both sides of the conflict that she concluded that violence for any purpose could never be justified. After Weil returned to France, ill health kept her from returning to teaching. Her burn was slow to heal, she was anemic, and her debilitating migraine headaches became worse. She spent the last of the 1930s reflecting and writing about war and peace, at the same time beginning to formulate her thoughts on the nature of force, on the human spirit’s tragic subjection to it, and on mankind’s temptation to worship it. These reflections found expression in early 1940 in two essays, ‘‘The Iliad, or the Poem of Force’’ and ‘‘The Great Beast,’’ which was a long essay on the rise of Adolf Hitler. Conversion Experience. In 1937, Weil underwent a spiritual conversion, complete with mystical experiences. For instance, at the chapel of St. Francis in Assisi, Weil was so overwhelmed by the presence of ‘‘something stronger than [herself]’’ that she was forced to her knees. She memorized George Herbert’s poem ‘‘Love,’’ and used it as a meditation when she had migraines. Because she had previously believed that God did not directly reveal himself to individuals, Weil was convinced that her mystical encounters were authentic. This religious transformation led to a change in Weil’s political views: She turned from political and social action to a search for spiritual truth. Time in Marseilles during World War II. Following the German occupation of Paris in June 1940, Weil and her parents fled to the south of France, residing in Marseilles from September 1940 until May 1942. Marseilles was located in a part of the country that remained ‘‘free’’ under a provisional government approved by the Germans and based in the city of Vichy. During the time she spent in Marseilles, Weil was productive in her writing. She wrote essays on problems in modern science, a number of essays on religious subjects, and her Marseilles Notebooks. Though reluctant to leave France, Weil was persuaded to accompany her parents to New York in May 1942. Before she left, she gave her notebooks to Gustave Thibon, a noted Catholic philosopher and writer, urging him to use her ideas in his own writing. Once in New York, Weil hoped to interest the U.S. government in a plan she had to organize a corps of nurses who would go into battle with the soldiers in order to give immediate aid, thereby saving lives that would otherwise be lost due to shock and loss of blood. Weil’s proposal was turned down, and after five months in New York City, she traveled to London to work for the French Resistance, which fought back against the German forces in occupied France. Believing she was called by God to experience the perils of war, she asked to be parachuted into France to disrupt the war effort; instead, she was given a desk job and asked to develop her own ideas about how France should be reconstructed after the war. The result was The Need for Roots: Prelude to a Declaration of Duties Toward Mankind (1949), a treatise on both the causes of modern man’s loss of roots in the sacred and her suggestions for a solution. Reported Suicide. Limiting her food to the amount that the French were allowed during rationing, Weil was overcome by stress and malnourishment, and in April 1943 she was hospitalized with tuberculosis. Even in the hospital, she was either unwilling or unable to eat more than meager amounts. She died in a sanatorium in Ashford, Kent, on August 24, 1943, at the age of thirty- four. The local newspaper described her death as a ‘‘voluntary suicide.’’ The story that she died because of her solidarity with the starving French captured the popular imagination, and Weil was widely seen as a kind of crazy secular saint, admirable but ludicrous in her intensity and impractical idealism. As her writings were published and translated in the 1950s and 1960s, this image gave way to serious study of her work. Dietrich Bonhoeffer (1906-1945): German Lutheran theologian and founder of the Confessing Church, he participated in the German Resistance movement and was centrally involved in Abwehr (German Military Intelligence) plots to assassinate Adolf Hitler. Charles de Gaulle (1890-1970): A French general and leader of the Free French Forces, de Gaulle founded the French Fifth Republic and became its first president. Edith Stein (1891-1942): A Carmelite nun and German philosopher, she became a martyr of the Catholic Church upon losing her life at Auschwitz. Anne Frank (1929-1945): Frank was a German-Jewish teenager who kept a journal while her family was in hiding during the Holocaust. John Dos Passos (1896-1970): This American's bitter novels attacked the hypocrisy and materialism of the United States between the two world wars. Weil’s writing reflects the paradoxes of her life: Profound faith with intellectual skepticism, deep compassion for the suffering of others with a disregard for her own suffering, and a logical mind with a mystical spirit. Even though Weil’s theories were not consistent and did not adhere to the conventions of traditional philosophical argument, they contain several recurring concepts essential to understanding much of her work. Destruction of Self. One of Weil’s most basic concepts was that the self must be destroyed in imitation of Christ’s self-sacrifice. Weil did not see the crucifixion of Jesus as a sacrifice that relieved mankind of its burden of sin, but rather as an inspirational model that the believer should follow. The experiences of abandonment and self-sacrifice, the ache of the absence of God, were, for Weil, necessary preludes to redemption by God’s love. Weil considered The Iliad to be the perfect example of pacifism because it presented the absolute futility of the Trojan War. In her essay on Homer’s epic, Weil concluded that violence degrades both the victim and the victor; violence makes people selfless ‘‘things.’’ To Weil, a soul destroyed externally was the ultimate sin because then the soul could not be sacrificed to God. This sacrifice was the key to atonement and redemption. Manichaeism. Another fundamental belief found in Weil’s writing is related to Manichaeism, an ancient religious doctrine based on the separation of matter and spirit and of good and evil. Weil expressed this duality as the tension between ‘‘gravity’’ and ‘‘grace.’’ The physical universe is drawn downward by gravity; Weil considered these physical laws inherently evil because God is absent in the physical world. Since God is absent, man cannot be near to God. The only hope for mankind is to wait for a visit from God, who will uplift man’s soul to himself. This is grace. Universal Faith. Weil also believed that some elements of Christian faith, including the possibility of redemption, exist in all religions. Moreover, they existed in myths long before the birth of Christ. Weil’s studies revealed these elements in many ancient religions, illustrated, for example, by ancient Greek writers such as Sophocles, Plato, and Homer. In fact, within Platonic philosophy, Greek tragedy, Hindu Upanishads, and ancient Egyptian and Chaldean writings, she believed she had found the basis for an ideal society: a truly Christian civilization that would be hierarchical yet non-oppressive. Influences. Weil published only magazine articles and poems during her lifetime. The bulk of her work was collected from her notebooks by J. M. Perrin and G. Thibon and published after her death. Nevertheless, Weil’s limited writings have affected everyone from philosophers to filmmakers. Albert Camus, after winning the Nobel Prize in Literature, spent an hour meditating in the deceased Weil’s room before boarding the plane for Stockholm. Iris Murdoch’s writings are marked by Weil’s intellectualism. Even writer Mario Puzo and director Francis Ford Coppola are reported to have turned to Weil for inspiration when working on the script for The Godfather III. The Human Condition (1958), a philosophical work by Hannah Arendt. This work examines activities in realms most important to her ''labor, work, action'' in the context of society, politics, and the public and private sectors. Homo Sacer: Sovereign Power and Bare Life (1998), a philosophical work by Giorgio Agamben. This work is an exhaustive study by the Italian philosopher focusing on the place of the individual in society. Working (1974), a book by Studs Terkel. In this collection, the social historian examines the work blue collar workers and investigates how such work gives or does not give their lives meaning. Weil wrote on both her secular thoughts and spiritual beliefs. Her works were intellectual and enthusiastic, eliciting mixed reviews from critics who focused on her mental instability or praised her philosophical insight and literary prowess. Genius and Madness. At the time of Weil’s death, she was generally regarded as a crazed fanatic who exaggerated her interests in human salvation; however, she eventually earned a favorable reputation as one of the most original thinkers of her era. Eminent figures like Charles de Gaulle, who, as the leader of the Free French knew Weil slightly, considered her mad. Others who knew and respected her honored her genius. French existentialist playwright Gabriel Marcel admired her greatly, and T. S. Eliot described her as ‘‘a woman of genius, of a kind of genius akin to that of the saints.’’ Had Weil been better appreciated in her time, she might have contributed much more than she did posthumously to political and social thought. She had visions and awakenings that prevented her from being taken seriously, but she also had premonitions and theories that might be regarded today as uncanny in their foreshadowing. Other critics have decided that while, as scholar Jean Amery says, ‘‘the prestige of her death has shielded her from criticism,’’ Weil’s work must be examined in global terms. Weil has been harshly criticized for being a Jewish anti-Semite and for what critics have called misguided political suggestions. She denied the presence of any divine revelation in the Jewish religion, but found it in many other faiths besides Christianity. She advocated sacrificing Czechoslovakia to Hitler in the 1930s, writing in her 1943 notebook that the French ought to have used Gandhi-like passive resistance against the Nazis. S. M. Fitzgerald of the New Republic judged that the intended audience or target would not benefit from her thought: ‘‘[Weil’s] thinking is sometimes idiosyncratic in the extreme, displaying a lack of objectivity that seems almost willful, and some of her outbursts are so emotional as to be almost altogether untrustworthy.’’ In general, as the reviewer for the Times Literary Supplement said, the ‘‘provocation to agree with her, and more often to disagree, is...strong.’’ Although dissent and controversy surround her work, most critics concede that Weil demonstrated penetrating insight and unquestionable integrity in all of her writings. 1. Research people who have gone on hunger strikes as a form of protest. Choose one individual whose story intrigues you. Prepare a speech that you would give on behalf of that individual, stating his/her cause and including comparisons to Weil’s situation. 2. Some critics relate Weil’s religious writing to the work of Blaise Pascal and Ludwig Wittgenstein. What commonalities does Weil have with these two writers? Are there any contemporary figures whose religious writing compares to that of Weil’s? 3. Define ‘‘radical humanism.’’ Create a timeline of individuals whom you think have demonstrated radical humanism. Each person on your timeline should have a picture of him or her and a short description of what makes this person’s actions an example of radical humanism. Cohen, Arthur A., ed. Arguments and Doctrines: A Reader of Jewish Thinking in the Aftermath of the Holocaust. New York: Harper, 1970. Milosz, Czeslaw. Emperor of the Earth: Modes of Eccentric Vision. Berkeley: University of California Press, 1977. Petrement, Simone. Simone Weil: A Life. New York: Schocken Publishing, 1976. Rosenfeld, Sidney, and Stella P. Rosenfeld, eds. Radical Humanism: Selected Essays. Bloomington: Indiana University Press, 1984. Twentieth-Century Literary Criticism, Volume 23. Detroit: Gale, 1987. Weil, Simone. The Notebooks of Simone Weil. London: Routledge, 1984. Fitzgerald, S. M. New Republic (August 18, 1952): 18; (July 2, 1977): 33-37. Times Literary Supplement (July 28, 1989): 821; (July 13, 1990): 747; (August 23, 1991): 7. Turner, Jenny. New Statesman (August 28, 1987):24; (September 4, 1987). The American Weil Society Colloquy at the University of Notre Dame. Retrieved February 14, 2008, from http://www.nd.edu/~weilaws. Thomas, Brian. Introducing Simone Weil through the Internet. Retrieved February 14, 2008, from http://www.rivertext.com/weil.html. ________. Rivertext: Simone Weil in the Godfather. Retrieved February 14, 2008, from http://www.rivertext.com/weil1c.html.